“I like to capture a large world and at the same time give the reader the sense of being drawn in to an intimate moment or place,” Simon James says of his work. While many of his charming, whimsical picture books draw readers into the “large world” of nature, Simon James is equally adept at capturing an intimate moment of urban life as well. It’s the magic of nature that provides the setting for some other of Simon James’s picture books, such as Sally and the Limpet, a breezy fable about the need to respect the natural world, and The Wild Woods and The Birdwatchers, two delightful stories about the wry relationship between a grandfather and his granddaughter. In Little One Step, Simon James uses his expressive imagery to tell the tale of a tiny duckling who makes a useful discovery—and to encourage even the most tentative of us to take that first step, no matter how small. While many of Simon James’s picture books have a lighthearted quality, the author-illustrator says he does not like stories that are “too polite, with nice things always happening,” because “life isn’t like that.” No such criticism could be applied to his fiendishly funny books about Baby Brains. In Baby Brains, Simon James tells—tongue firmly in cheek—the remarkable tale of the smartest baby in the world. “This story came about as many of my friends seemed to be having ‘clever’ babies of their own,” he notes wryly. Simon James’s follow-up, Baby Brains Superstar, shows the smartest baby in the world take a turn as a pampered rock idol. With a dazzling custom-made outfit, his (single) hair expertly styled, and a helicopter lowering him onto the massive stage as an enormous crowd roars, Baby Brains is ready to make rock ‘n’ roll history! 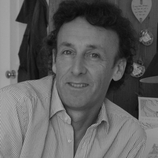 Simon James was born in Devon, England, and now lives in Plymouth, England. Between leaving home and starting art school to specialize in graphics, he had fourteen different jobs, including police officer, restaurant worker, real estate agent, and farm worker. “But always at the back of my mind was the desire to perfect my drawing,” he says—and the world of picture books is fortunate that he did.